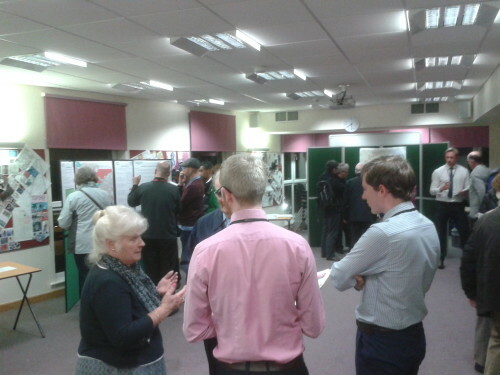 The Council drop-in sessions – organised to allow members of the public to examine the proposals and ask questions – have been extremely well attended, particulartly in Brighouse, and it was good that ward councillors were also there to guage the extent of local concerns. Community meetings are also starting to be organised; I went to an excellent one on Sat 28th Nov arranged by the Stainland Community Association to allow local people to inform themselves about the proposals and submit comments. Anthony Rae, for Calderdale Friends of the Earth said: “The pressure all these proposed development sites will place on Brighouse is just extraordinary. They would transform the nature of the town. There are no fewer than four possible urban extensions to choose between, containing almost 7000 new houses; additional separate housing sites for maybe another thousand units; the long-standing 25 hectare Clifton Road employment site; a Brighouse bypass and a new motorway junction! And most of these sites are on Greenbelt. The proposed development in nearby Elland will then just worsen the cumulative problems of the Lower Valley. … and as a next step have revealed (in a letter to the Courier published on 27th November) that they intend to ask Calderdale Council’s Cabinet at its next meeting to undertake the work that could demonstrate if a more sustainable pattern of development for Calderdale based round brownfield regeneration – rather than Greenbelt loss – is possible. FOE letter “Mark Thompson, Calderdale’s director of economy and environment is quite right (‘Borough must agree on plan or the government will act’ 20th November), and the Courier’s great coverage last week will help communities have their say about the future of where they live.